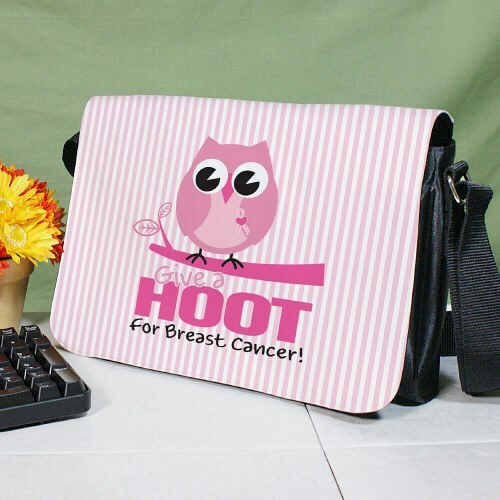 Our Give a Hoot Breast Cancer Shoulder Bag is the perfect way to display your support for breast cancer. Use this Large Breast Cancer Tote Bag for your day to day trips, whether it’s out shopping with friends, at the library or breast cancer awareness events. These also make for great breast cancer awareness gifts. Our Stylish Breast Cancer Awareness Large Shoulder Bag with Detachable White 10'' x 12.5'' Flap measures 8h" x 12w". The black sateen purse features an adjustable shoulder strap with an inside pocket zipper closure under the flap. Today’s Price: $30.99 Only 11 left! In recognition of breast cancer awareness month, MyWalkGear.com is donating 15% of our Personalized Breast Cancer Shirts and Walk Gear proceeds to help find a cure. Browse through our large collection of Personalized Breast Cancer Gifts to find unique Personalized Breast Cancer Walk Apparel, Personalized Breast Cancer Keepsakes and so much more!